Despite the regular line changes Catrice has, this is still around. It retails for €4.59, which really isn’t much for a decent highlighter. This product is fully vegan according to the brand and should be quick and easy to use. 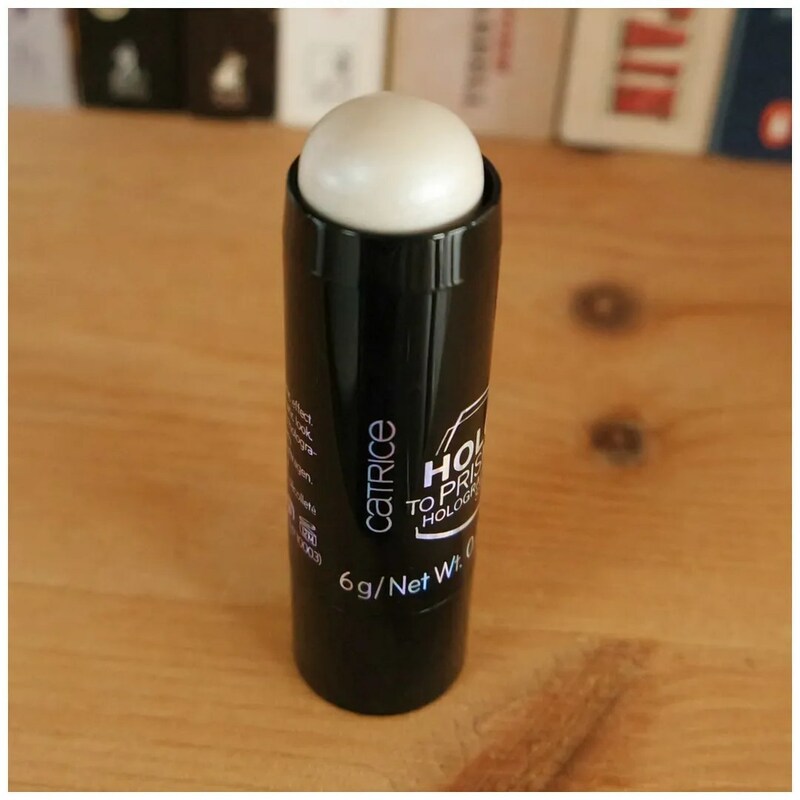 A cream stick like this is best applied over other cream products, but I prefer to use them under my base products to give my powder highlight a bit more of an oomph. What this is, is a creamy stick. The stick is twist up and the cap showcases that this is a holographic product with a pretty rainbow effect. What I mainly look for with sticks like this is that I can twist them up and down without having to press the product back in. In this case there are no issues and the stick is easy to use. The first thing I like doing when I review any stick product is see how much product you get. In this case: not so much. This picture here shows you how much product you get when you twist up the stick all the way. So that isn’t great. Another thing you will instantly notice is that the highlighter has a silver/ white sheen, which is anything but holographic. Another thing I look for with these kind of highlighters is their texture and blendability. Sometimes, stick products can be a bit greasy and work badly with other makeup. If too greasy it will break up other makeup you apply under or over this, but I find this isn’t too dry, nor too greasy and it has good lasting power. It blends easily, but when you blend this out you can see some very very small sparkly bits. That is a shame, because products like this are usually better if they are more of a metallic sheen, rather than containing sparkle. I like the shade though as it has a nice pearly sheen, which is very pretty on fair skin like mine. 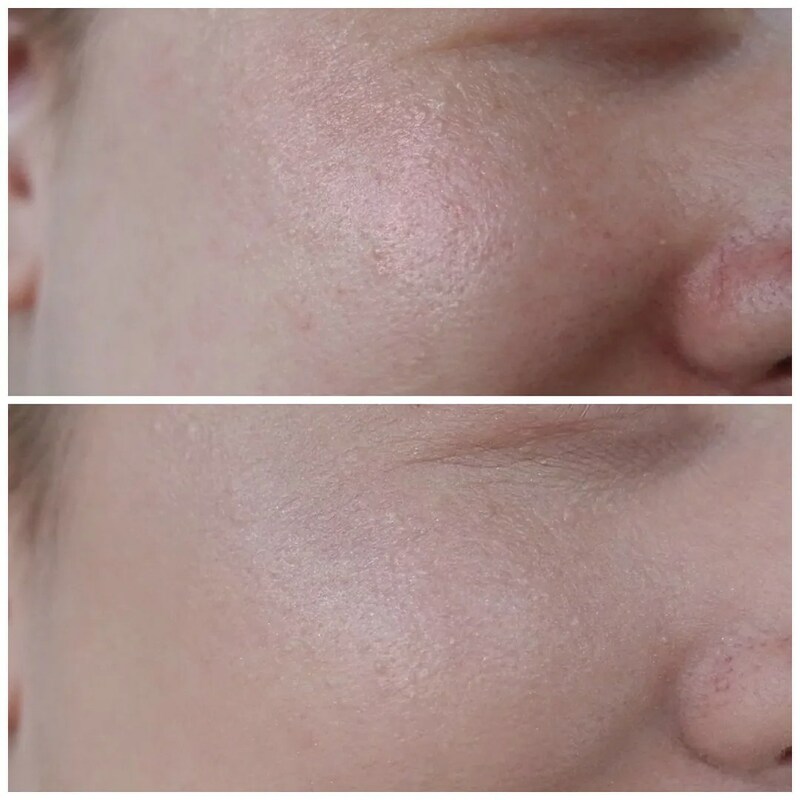 So to show you what this does on the skin, I have put on a before and after picture. Above is my face with just primer. That looks quite glowy already as the primer I was using here had a bit of glow. At the bottom you can see the highlighter applied. As you can see, it is a pretty subtle glow. 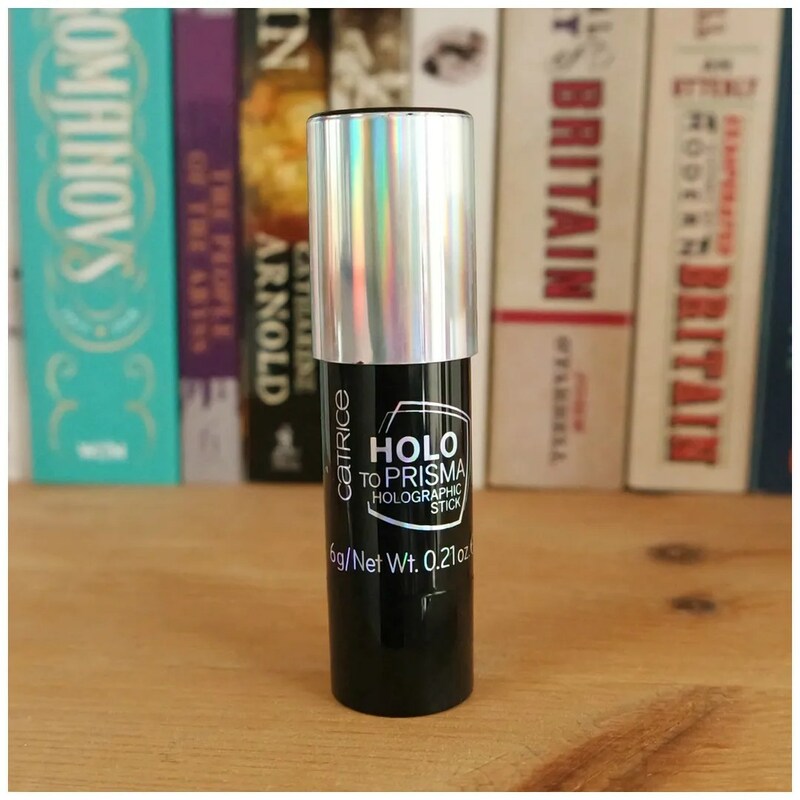 This is a great highlighter for every day and it is quite fuss free. The way I like to apply cream sticks like this is with my fingers. I apply the stick to my fingers and then rub the tips of my fingers from both hands together. It waters down the effect a bit, but it makes for the best blend. Applied straight from the stick might move foundation or primer around as it need some time to warm up. That is why I like rubbing some on my fingers first as it warms up the product and has it blend mesh in with your skin a lot more flawlessly. 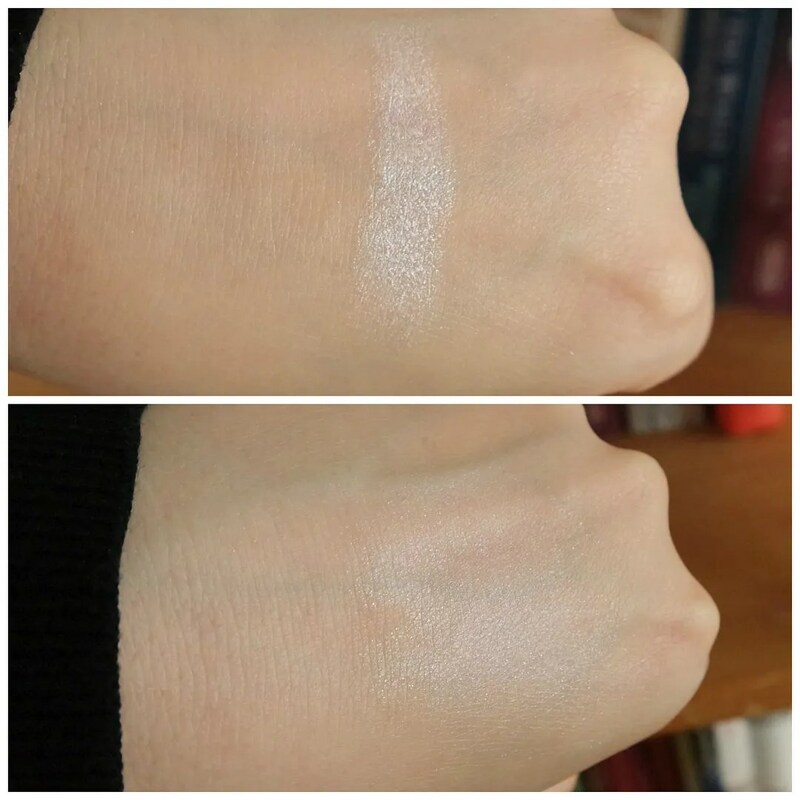 While this may not be holographic in the slightest, the Catrice Holographic highlighter stick is still a very pretty every day highlighter for fair skin. 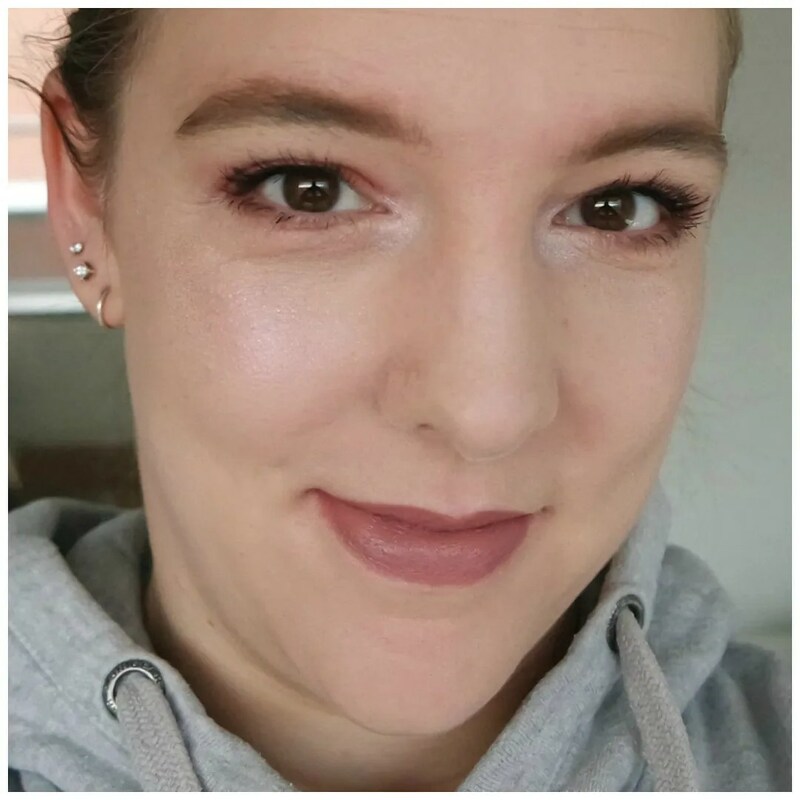 Use it under or over a base to add that bit of extra healthy glow to your face and you will have a nice natural look that is perfect for your job, school or just on the daily. 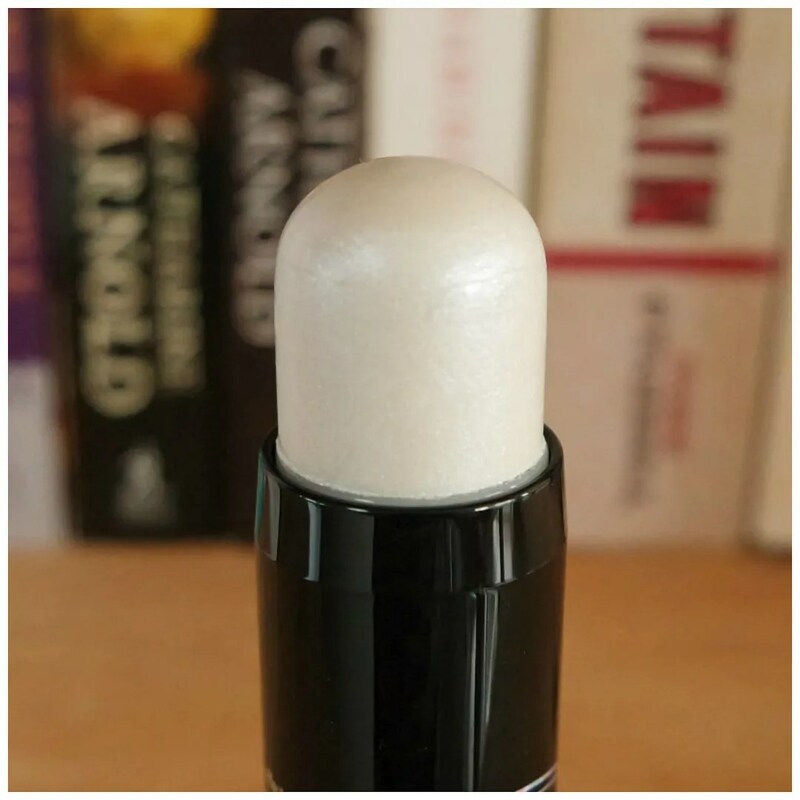 What do you think of cream highlighter sticks? I haven’t tried highlighting sticks yet but I do like a liquid highlight to apply under my base. I quite like sticks, but only some. They can be a bit hit or miss. Uh this looks so pretty!? I always think of highlighter more for going out when I’m wearing more makeup but your look here is sooo glowy and perfect. I may be a convert! I wear highlight every single day! I can’t go without it.